Black Gate » Articles » A (Belated) First Look At Basic Fantasy Role-Playing Game. Tabletop Role-playing is no longer the only escapist hobby in town. To entice us away from our screens and board games, requires a coherent user experience. And modern games in games in general have a higher standard if usability than those of yore. When I played AD&D again, in my early 20s — hey Gerard! — some of the underlying rules had stopped working for us. As a teen, it was fun to slog out of 1st Level. It felt like a real achievement to hurl more than one Magic Missile, and to strike down goblins with just a little more consistency (I tended to play an Elven Fighter Magic User). And it was fine — amusing! — to play weak characters until they leveled up or got killed. Playing once a week, year in, year out, the grind was part of the fun. However, when there there were big breaks due to life — we played mostly during the University holidays when we were all in town — then the experience of elapsed real time, loomed larger than game time: If you roll up a bad character at Christmas, you may be still playing them in October break, and still have only one boring 1st level spell to use once a day. We were ow doing grinding in real life. Role-playing was about escaping into a world where we had agency. So, like most groups, we patched the system with rules we made up and others that were to hand. Mages got freshened up with cantrips — fun low-powered spells they could use carelessly — and enhanced casting options. Everybody got to roll “4D6 take away the lowest” for stats, so skipping the part where we played weak characters into the ground. And these days, most people’s lives are like that, even school kids, who have much, much less leisure. So that’s the second thing that’s changed: time. So why look for an OSR game at all? 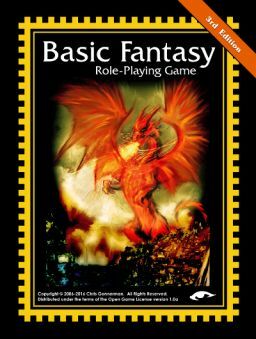 Which takes me to Basic Fantasy Role-Playing Game, which my mate and fellow gamer dad, Brian, sold me on after several coffees at Christmas. You can download the PDF free from their site, however, they sell the hardcopy on Amazon at pretty much cost — the coffee I’m drinking right now was more expensive. You get a nice softback, about the size of the old game books, full of slightly old-school illustrations (with which I have liberally sprinkled this article). It has enough gravitas to impress a pre-teen, and enough retro charm to give a middle aged player flashbacks to afternoons spent listening to Jethro Tull while the dice rattled and hair grew longer. The book itself is a self-contained roleplaying game: character classes, equipment lists, spells, adventure generators… you can even design and build a stronghold. However, there’s a tonne of extra material downloadable from the site, most of it community generated but with quality control by the creators, who are doing this for fun, rather than enterprise. That’s a good thing because, though the rules are greatly tidied up compared to old AD&D — consistent stat bonuses, limited choice of weapons, ascending armor class, etc — some of the grind of the original 1980s games is preserved, especially for magic users who need heaps of experience points and cash to progress and aspire skills. The downloadable additions are leaner versions of the additions of the 80s. So we can, for example, be Paladins or Rangers, use Cantrips, and adopt fuller equipment lists. Before we get to the strengths, a note on the weaknesses of original D&D that are also preserved, these being inconsistency and ambiguity. The biggest inconsistency is that Level and Class are not always mechanically applied where they seem relevant. Thus, for example, nobody gets better at spotting secret passages, not even dwarves, and though level affects your attack role, it has no direct impact on your defense… actually it does impact on your defense through the abstraction of Hit Points — how much damage you can take (why am I explaining this to you if you’ve read this far? ), which do rise with your level, meaning that it takes more hits to take you out. You can interpret that as meaning that each hit does less actual damage once it’s gotten through your defense. However, the damage dealt doesn’t rise with the attacker’s level, so that two high-level characters fighting will have to grind through each other’s zillion hit points, D6 by D6 — when a good simulation would allow Conan and Elric to cut each other down in single blows. And then there’s the thing that Hit Points apply outside combat situations, thus a high level character takes the same damage from falling as a low level one… it’s probably best not to think about this too much. The handling of Thief skills takes us from inconsistency to ambiguity. Just as in the games of yore, the Thief has specific skills such as Open Locks and Hide expressed as percentile chances rather than handling them like combat skills. There’s also no real guidance on how to handle ordinary characters hiding, or what the benchmarks are: presumably the Thief skills relate to utterly heroic situations, such as hiding behind a pot plant in a room full of goblins, but what then of the other character classes? What do they roll to hide, and does that chance improve with level? 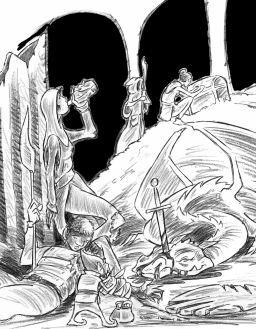 The general rule seems to be, the DM makes stuff up… which is the OSR way. Otherwise, this is a really impressive rule book. The slim volume covers everything you need to play, has useful descriptions for each equipment item, and well-organized rules for hiring help, building strongholds, and fighting sieges, plus lots of random tables, and some terse but good advice for referees. The section on encounters, including combat, is a model of good technical communication. 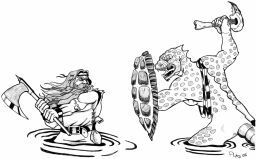 Also, the monster lists includes familiar enemies from my teens including the good old Gelatinous Cube, and there are nice illustrations. 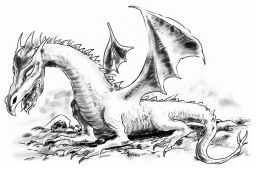 However, what really stands out is the way that Basic Fantasy Role-Playing Game is beautifully optimized to support the core game that we only dimly experienced under AD&D‘s accretions. For a start, with a less… busy(?) body of rules, the bewildering variety of dice suddenly makes sense. The system prefers D6 as standard — roll 1 to be surprised etc — and then prefers to change the die rather than add modifiers. This seems inelegant and arbitrary until you realize that: any modifiers are then in proportion to the original probability; and, once you have the dice in hand, you can keep rolling them. This last lets the DM more or less industrialize the process of looking for traps, finding secret doors and so on (and presumably explains why levels and and stats bonuses have no effect). Second, and far more importantly, the pared down rules and equipment lists support internally consistent and dramatic dungeon bashes and hex crawls. Where as most rules-light games, such as Fate Accelerated, achieve their lightness through abstracting resources, resource management, and consequences, BFRPG (and Basic D&D before it) does this by simplifying the range of choices and resources, but maintaining a granular resource management system. This is much more fun and dramatic than it sounds. You track time in a dungeon because light sources and supplies run out. They run out because you can only carry so much. Once you have the treasure, you probably can’t carry it all out, so you have to pick and choose. Similarly, 20 longbow arrows cost 2GP, the price of a dagger, and weigh 2 lbs. You will use them with care at the penniless start of your adventures, and still decline to spam them when you are far from resupply. Fortunately, it’s easy to track how much are carrying because (1) You have the spare brain power because the the rules aren’t burdened by complex exceptions and feats, and (2) there are only 44 items on the equipment list, and about half as many weapons, most with similar weight. Overall, this game does what it sets out to do, and does it with conviction. It’s an inexpensive, exhaustive, and approachable system. A motivated early teen could master it quickly, though with some mentoring because they would need to know what roleplaying was and would be well advised to ignore the paragraph where it recommends that players be responsible for mapping according to the DM’s descriptions, They might also want to apply selected additions from the website’s PDFs. as a free download by clicking through to the website. PDF before buying from Amazon. Good review. I bought this because of the price and I was looking for something less crunchy than Pathfinder/3.5. I even downloaded everything that looked interesting off of their website. But my group of friends prefers board games so we don’t play that much. So I never ended up trying it out. Plus once 5th edition came out that worked well the few times we played it so if i play again it will probably be that. I am interested to see what you think of the system after several plays. I snagged the pdf some while back and while I enjoyed reading the rules for its nostalgic feel, I stuck with 5e D&D. For all its faults (and there are a number), 5e is much more streamlined than earlier versions of D&D. Of course 5e has been out a while now and things are becoming more complicated with more and more books, but that was bound to happen anyway. Then again, my favorite tabletop RPG has always been SPI’s Dragonquest, and it was definitely not streamlined and had plenty of ambiguity. Hey, thanks for the kind words! I always love to read a good review of our game, especially when the writer has gone to some effort to read and understand the material. Thank you! Just wanted to comment on one part: the “weaknesses … that are also preserved, these being inconsistency and ambiguity.” First of all, a primary goal of the game was indeed to preserve the experience of the classic games, and the “inconsistent” rules were a part of that. But inconsistency serves other purposes. I’ve found, in many years of playing and more than a few of writing RPGs, that consistency in its primary form, the “core mechanic,” is overly limiting. If all you’re given is a hammer, everything must be made to look like a nail, even if it isn’t. BFRPG thus uses the classic d6 mechanic for many things, including finding secret doors, detecting traps, forcing stuck doors, and the like, because the mechanic is simple and strongly favors high ability scores. It preserves the d20-based saving throw and attack roll mechanics because the finer grain of the roll allows a wider variety of modifiers to be applied. Thief abilities are expressed mostly as percentages because those abilities require an even finer grain, in order to accommodate 20 levels of ability. Using a single mechanic for all of that requires so many special cases that the “single” mechanic becomes a bunch of similar, but not identical, mechanics. As for ambiguity… you say bug, I say feature. The real core feature of the old games was GM Fiat. The rules are left loose enough, and incomplete enough, to allow the GM to tweak or adjust any part that doesn’t “feel” right. GM Fiat can be a problem for newbie GMs, of course, but I would (and have) argue that Fiat lets a truly great GM shine. Games that provide more detailed rules thus require less experience from the GM, but they are also harder to create adventures for. In a modern game, when the player wants to do something the rules don’t cover, you first spend a bunch of time trying to find the rule, then struggle to figure out how to handle it… or the GM just says, “you can’t do that.” In a classic Old School game, the GM has a much better grasp of what the rules cover and has experience making rulings already, so that new thing that doesn’t have a rule is quickly handled. If the situation crops up regularly, it becomes a house rule, possibly modified after the GM has time to evaluate how well his or her ruling is working out. Again, thanks for the review, I really appreciate the time and thought you put into it! Glad you liked the review! And I do see the argument that a bit of fuzziness is good, not least because it makes it harder to take a min/maxing approach. I also agree that detailed rules are problematic and I myself hate GMing them. Thief percentages make sense, but they also take into account stats (because you need certain stats to be a Thief), and rise with level. For other character types, it would be good to have a mechanic that takes Level and Stat Bonuses into account that *isn’t* a table. Nice review. What really spoke to me were your comments on standards and time. You hit the nail on the head. The game itself sure looks intriguing. I love the fact it is being produced for the love of gaming. Hope it does bring in many new players. I want to point out, Harold, that now that you’re gaming with the OSR, every. single. thing is available to you. Some things you still don’t like about BRP? Change them! The OSR, writ large, is a community of innovative home rules, many available for free. Check out Swords & Wizardry, Labyrinth Lord, Sharp Swords & Sinister Spells… oh my, it’s impossible to list them all, and most of these systems “hack” the Original Game to emulate a specific genre. You can hack your game, too. You’re starting her out young, so this shouldn’t be a problem. But I recently discovered that multiple mechanics can be opaque for new gamers. Maybe my recent article can be a resource for you. She’s been playing on and off since she was 6, but this is my first attempt to do something sustained. You’re right about the multiple mechanics. I’m hoping these are few enough. The other candidate is Fate of Cthulhu but that’s not out yet. The attacking character rolls 1d20, adding any bonuses to hit (like weapon proficiency or magical weapon bonuses, or Dexterity ability modifier to missile attacks). If the number is equal to or higher than the AC of the enemy being attacked, the enemy takes damage. Damage is allocated as follows: 1 point for roll equal to AC, +1 point for each number higher than the AC, to a max damage of the weapon’s damage. In other words, the to-hit and damage are calculated with one 1d20 roll. The strength ability modifier is then added to the damage for melee and some missile attacks (specified in certain missile weapon proficiencies, like slings). Strength ability modifier damage is ONLY added if the enemy is hit. It is not added to the attack roll. I find this system better than rolling a separate die for damage, because 1) it reduces a lot of extra unneeded dice rolling during combat, and 2) better represents whether say a lower level character could do massive damage to a much higher level character / NPC. This “the combatant barely hits you and then does max weapon damage” never made any sense to me. So Damage = Shift + StrBonus, capped by weapon stat? It depends on the narrative you layer over the abstraction. If we are being strictly simulationist, against humans, all weapons ought to do the same damage, since an attack may represent several actual strikes, or one good one – e.g. I multi-tap you with my longsword, or hit you just once with my mace. Armour doesn’t absorb damage, it makes it harder to land a good hit. For example, a glancing swordblow against plate would do nothing. However, getting in with a dagger and jabbing it through a knight’s groin would take him out then and there. Some anti armour weapons make it easier to hit certain kinds of armour but are rubbish otherwise: try using your two handed flail against a guy in a loin cloth darting in and out in open ground! 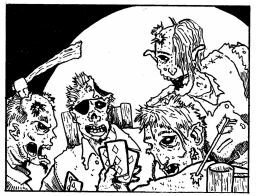 If I were to try to patch the OSR/D&D system,I’d have enemy Combat Bonus (i.e. Level) set the difficulty of hitting. Oh and longest weapon attacks first. Defender gets -2 defence if they are trying to close.